In the lead up to Ed Dale’s event (this weekend) I’ve been able to line up a few interviews with those part of the expert line up. Today I have the final piece in the puzzle… Lynn Terry (www.clicknewz.com). Lynn Terry stands at the forefront when it comes to the highly competitive battleground of affiliate marketing. What I like most about Lynn is her varied skill set – she’s been successful on so many levels from information sites to big commercial sites. Lynn’s definitely no one trick pony. 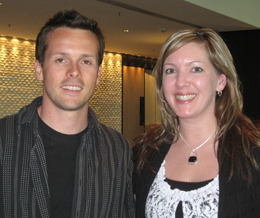 Now, with 12 years internet marketing experience, Lynn’s method’s have been well and truly honed. In this interview I drill down into the exact system she uses today – the deadly combination of affiliate marketing and SEO. Obviously, if you’d like to find out more, you can check her website ClickNewz – you’ll find loads of info on the latest eBiz trends, marketing strategies, unique case studies, creative ideas & personal reviews (it’s very cool). Anyway, enough chat… click here to download the interview in MP3 format and I hope to see you at the conference this weekend – be sure to say “hi”. PPs. Want to check out the new product Lynn mentioned in the interview? Click here. It’s no secret to most of you that without inbound links, your sites are invisible. They may as well not even exist at all. Without those backlinks, You get NO traffic, NO search engine rankings, NO sales and NO Profits. It’s time you did something about this backlink thing. It’s a brand new year and you’ve resolved to forge ahead on your road to success. Take action Now and make this your biggest year ever! Click here to find out more. I’ve heard of Lynn about a year ago, I guess while I was browsing for info about affiliate marketing. Now when I encounter the word ‘affiliate marketing’, I almost automatically think of her. You can call that top of mind branding or whatever. While I’m pretty sure that she also dabbles on other Internet marketing opps, would you say that it is best to just specialize on just one part of it? Be it being an affiliate, Adsense, selling info products, etc? I’m still in the process of finding my niche. Thanks for the comments/questions. I’d suggest if you’re just starting out to specialise till you “make it work” and once you have your core cash flow under control then you can look to try other things. Nice… am in the process of choosing which online business I want to start with and this clears things up about my preconceptions about affiliate marketing. I am thinking of starting with website flipping, but this an option I may well consider… Thanks! Do you know of any good place to start when it comes to affiliate marketing? I’ve read countless free ebooks about the topic, including articles, and they all point to Clickbank. I already have an account there, I’m just looking to diversify. They’ve got some great training and it should keep you a little more focused. I believe Lynn is getting ready to release her own affiliate marketing course. I’m not sure if it’s an ebook or a membership course. Either way that’s something to look forward to as I really like the way she shares tips and info on affiliate marketing. I like Lynn of only because she’s female. We hear of successful male internet marketers all the time but I don’t hear as much about female IM gurus. I have yet to go deeper into what she’s teaching.